I just love this suction cup mount for the GoPro. You can easily mount this to a glass surface using the suction cup. It has a lever that helps you to get a really tight seal on the suction cup. The mount moves in all directions and is adjustable so you can easily get all sort of angles. Then you can secure your GoPro into the enclosed clip and fasten it to the holder. I love this for in the car, that’s where I use my GoPro a lot and since it’s adjustable I can easily change the angle depending on where I want it to shoot. Super easy to install and use! COMPACT DESIGN – Ultra compact and powerful suction cup with locking bar. The cup size smaller than any GPS unit in your windshield. Dual-jointed arm allows for virtually any angle, 180 degree rotary head for easy framing. MazeTechno Suction Cup Mount for GoPro is made of high quality polycarbonate. 7cm-diameter base. VERSATILE SURFACE – Excellent suction to almost all clean flat materials include plastics, metals, glass, ceramic etc. Firm Attachment to your CAR’S DASHBOARD, CAR’S WINDSHIELD, CAR’S WINDOWS, BOATS, MOTORCYCLES. Stable even in bumpy road. Recommended for non-impact activities only, not recommended for surfing, snowboarding or other high-impact sports. 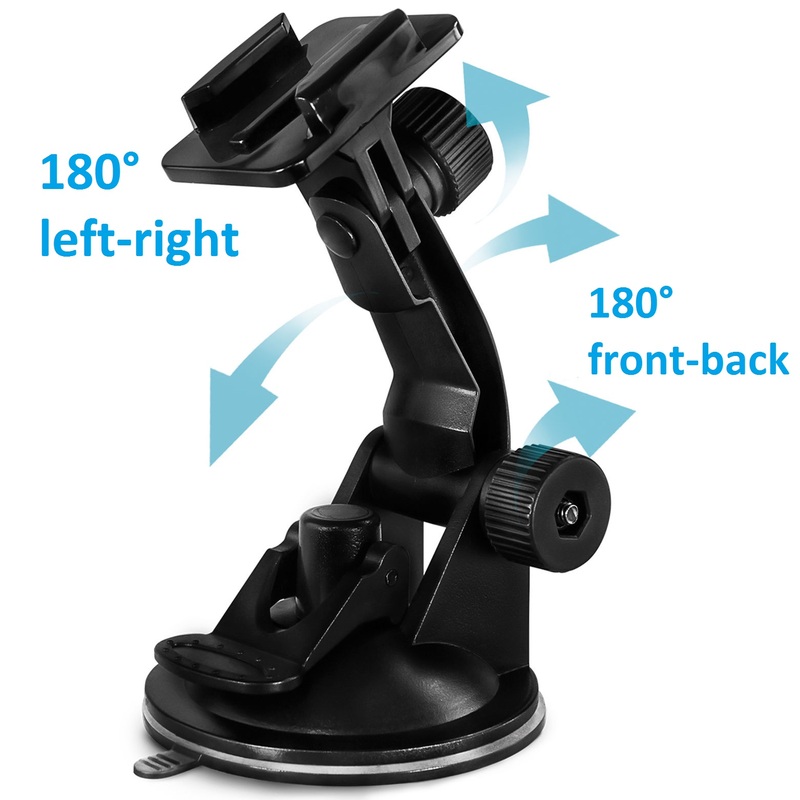 EASY TO SETUP – GoPro suction cup mount car is Easy to install and remove, no tool needed, no residual and scratch left. Quick release base makes moving between shots and locations quick, simple and convenient. ONE PRODUCT FITS ALL – Mazetechno Suction Cup Mount and the FREE Quick Release Buckle Base are Compatible with ALL HD HERO Original: GoPro Hero4, Hero3+, Hero3, Hero2 and Hero1 HD in Black, Silver and White editions. SONY Action Cameras, Xiao Yi, SJcam: SJ4000, SJ5000. 100% MONEY BACK GUARANTEE – If, for whatever reason, you don’t absolutely love your MazeTechno Suction Cup Mount, simply return it for a hassle-free, no questions asked refund.